The consequences of gender-based violence are serious. We know this, we’ve seen it, and many women have experienced violence directly. On December 6, 1989, Canada stood still. The brutal massacre of 14 women from l’École Polytechnique de Montréal, sent innocent souls to the grave – and shockwaves throughout the nation; a reverberation of horror and pain that can be felt to this day. It costs women their lives; every six days a woman dies at the hands of an abusive intimate partner. It costs you, too: violence against women costs taxpayers and the government billions of dollars every year. Canadians collectively spend $7.4 billion to deal with the aftermath of spousal violence alone. Children feel the impact of gendered violence too. Children who witness violence in the home have twice the rate of psychiatric disorders as children from non-violent homes. 29 years after the massacre, 1-in-4 women still face violence and harassment at work or at home. Women are still killed on a weekly basis. 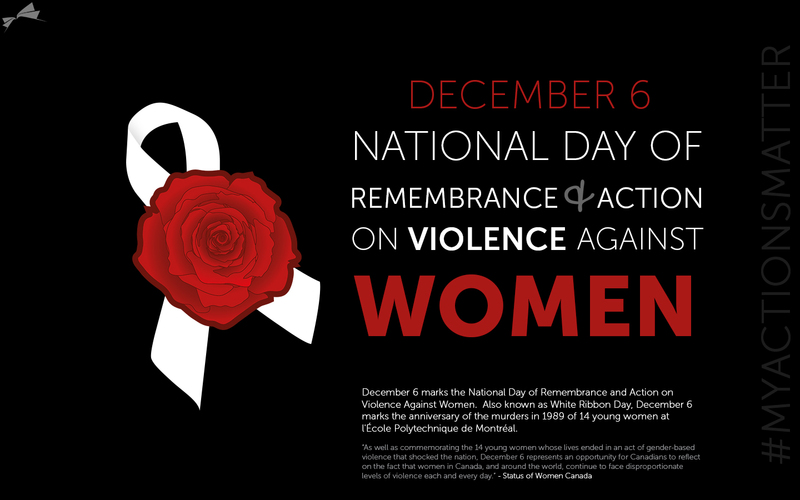 December 6th is not about violence in general – but about women and girls who are constantly, disproportionately impacted by this violence. There is a rise in toxic masculinity, incel culture, internet trolls, and toxic rhetoric that bleeds outside of private spheres and into our politics, government, and society. There is also a global reckoning, a movement in which perpetrators of violence will be held accountable by this generation – and with our fervent efforts, the next. Conversations around justice continue to ebb and flow – but there is no debate in the admonishment of murder and evil prejudice. Gendered-based violence is a serious violation of human rights. There’s no question that the majority of gender-based violence survivors are women and girls as a result of an outdated, archaic system of social structures and practices in which men dominate, oppress, and exploit women. The consequences of gender-based violence are grave. We cannot allow this violence to continue any longer. We cannot quietly accept burying our fellow human beings.